Our Church has existed here since 1944. Meetings began in a re-modeled funeral home. In 1947 a larger building was purchased and moved into town from Star. On August 16, 1950, the church officially incorporated as the Lamont Alliance Tabernacle with 13 charter members. The present building, which is located at the corner of 44th St. & 50th Ave was completed in 1983. In 1992 a portable and connecting walkway were added to meet the growing need for Sunday School rooms. In 2000 a second portable was added. 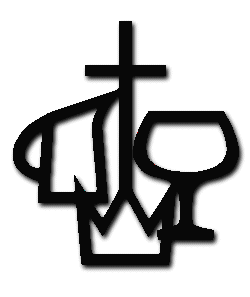 The cross, pitcher, laver and crown are the four symbols that join to illustrate our central theme in the Christian & Missionary Alliance, which is: "Jesus Christ is our Saviour, Sanctifier, Healer and Coming King." among men, whereby we must be saved,`` (Acts 4:12). The pitcher shows that we believe that Jesus Christ is our Healer. He is the same yesterday, today, and forever. He is the same, his power has not diminished, his hand is not shortened, and his ear is not deaf to our cry. Jesus provided for the healing of our mortal bodies by his stripes we are being healed. We have but to reach out and touch the hem of his garment by faith. The CROWN: Christ our Coming King. We believe in the Second Coming of Jesus Christ and the Rapture of the church. His coming is premillennial and can occur at any moment. We do not know the day, nor the hour, but that he is coming at any moment is our motivation for missions. For Jesus said concerning the time of his coming, "And this gospel of the kingdom shall be preached in all the world for a witness unto all nations; and then shall the end come."